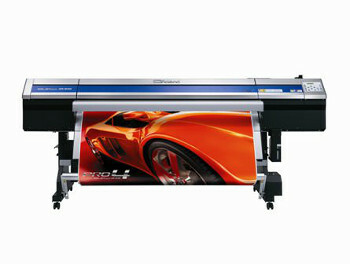 Roland DG Corporation, the leading worldwide provider of wide-format inkjet printers and printer/cutters for professional durable graphics, has announced the SolJet Pro4 XR-640; the industry’s most advanced printer/cutter to date. At 64 inches wide, the SolJet Pro4 XR-640 combines accelerated print speeds with Roland’s renowned integrated print/cut technology, an innovative new print head design, both seven- and eight-colour configurations, and new Eco-Sol Max2 inks in nine colours: cyan, magenta, yellow and black (CMYK), plus light cyan (Lc), light magenta (Lm), white (Wh), metallic silver (Mt) and new light black (Lk). The XR-640 is purpose built for production printing with a dual inline print head configuration that yields outstanding image quality at a maximum print speed of 49.1 m2/h (528.1 sqft. /hr). The XR-640 fires droplets of seven different sizes for exceptionally smooth gradations and flawless solid colours. Integrated contour cutting produces graphics of any shape in one seamless workflow. The Pro4 XR-640 features Eco-Sol Max2, a new generation of Roland’s award-winning eco-solvent ink, in four configurations: CMYKLcLmWhMt, CMYKLcLmLkWh, CMYKLcLmLkMt and CMYKLcLmLk. Eco-Sol Max2 dries fast and offers outstanding long-term outdoor durability, scratch and chemical resistance, broad media support and a wide gamut. Fully optimised for the XR-640’s new print head design, Eco-Sol Max2 is ideal for popular applications, including banners, signage, POP, decals, labels, vehicle graphics, backlit displays, building wraps, package prototypes and photographic reproductions. Eco-Sol Max2 adds value and impact to graphics with three specialty inks. New light black ink ensures a neutral grey for smooth grey scale gradations, natural skin tones and precise photographic images. An improved reformulated white ink offers even greater opacity for exceptionally bright white text, graphics and floods. Metallic silver, also improved for brighter colour, can be printed as a pure spot colour or combined with CMYK to create hundreds of shimmering metallic colours and effects.